This was a practical workshop on solar photovoltaics as part of a day-long event relating to Energy and International Development. 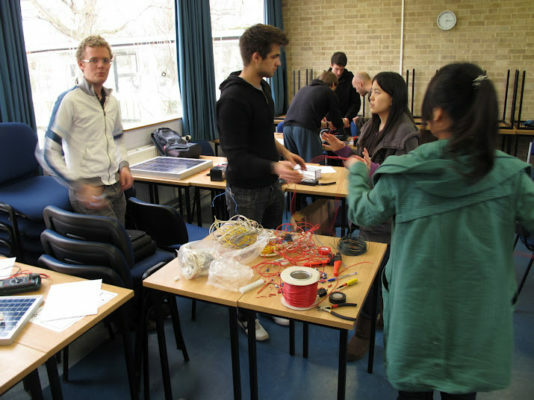 This course was organised by Engineers Without Borders UK and funded by the Royal Academy of Engineering (RAEng). 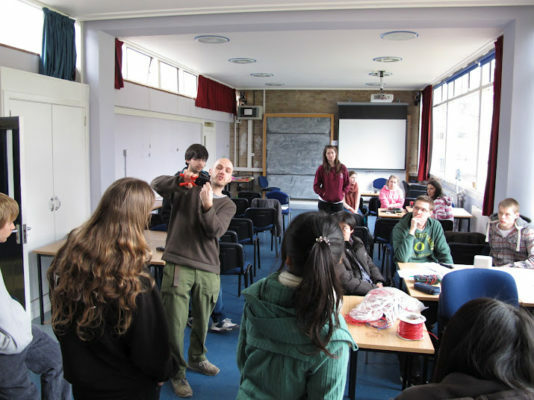 The workshop was provided for the Royal Academy of Engineering’s engineering leadership award scheme, with around 20-30 undergraduate engineers from a variety of backgrounds participating each year. The workshop consisted of lectures, role play sessions and practical hands-on sessions. Course content was provided by Milan Delor (on energy access), Jon Leary (on small wind turbine sustainability) and myself (stand-alone power supply systems and PV practical session). I gave a short talk on stand-alone power supply systems with a focus on doing installations ‘in the field’. They were then split into groups and each given the challenge of building a solar PV system to power the various loads I gave the group. In each group there was some form of challenge, maybe there were not enough PV modules to power the loads, or the battery was dead or a number of other problems. They looked into the energy balance of the system and produced a wiring diagram of the system. They then set about building and testing their own PV system. We set them up outdoors and then reviewed them at the end of the day.